Independence Station is a $15 million mixed-used development under construction in Independence, Oregon. Due to recent changes in LEED certification, the building had to be re-evaluated to see where it would fall on the new rating system (LEED v3.0). 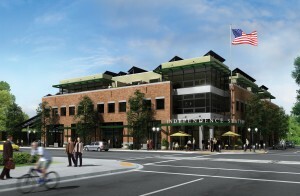 Under the previous version of the U.S. Green Building Council’s LEED rating system, Independence Station was projected to earn a total of 64 – 66 of the 69 points possible. The new system is based on a 100-point scale with 10 possible bonus points. Independence Station is likely to earn 101 of the 110 points, putting it right back on track to become the world’s greenest building. Steven Ribeiro of Aldeia, LLC, the Developer of Independence Station is pleased by the changes to the rating system. He believes that LEED v3.0 challenges developers to make buildings more energy efficient then ever before and hopes that other developers will out-score Independence Station in the future. The 57,000 square-foot Independence Station is set to open in 2010 and will host real and virtual offices, residential units, a restaurant and Internet cafe, DC-powered data storage facility, research facilities, product beta testing facilities, new product showcasing, and classroom space for professional as well as community outreach purposes. In addition, unique and highly efficient solar charged electric cars will be part of the project, as well as a large-scale rainwater harvesting system. Eco tourists and residents will be able to enjoy and learn about sustainable practices in the building’s one- and two-bedroom condominiums, with the goal of living well on just 17% of the total lifestyle energy that the average American now consumes in alignment with the very aggressive year 2050 goals of the 2,000 Watt Society. This collected data will be published on an open source basis for all to study to set new benchmarks for responsible energy consumption in daily living. A planned second phase of the project will include onsite food production and natural waste water treatment. 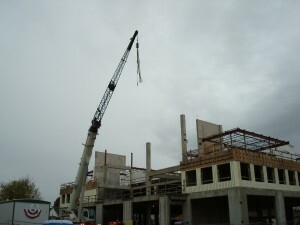 To keep track of the progress at Independence Station, Become a Fan of the World’s Greenest Building. This entry was posted in Green Certifications, Green Developments, Independence Station, LEED and tagged Independence Station, LEED certification, worlds greenest building on November 25, 2009 by Carol Morgan. As Independence Station progresses they form more and more partnerships with green companies that aid them in their quest to become the world’s greenest building. Recently, the green developers announced that they chose CALMAC’s IceBank® Energy Storage System for eco-friendly cooling of Independence Station. This entry was posted in Energy Efficient, Featured, Green Developments, Independence Station, LEED and tagged energy efficiency, green building, green developers, Independence Station, worlds greenest building on July 28, 2009 by Carol Morgan. Over the years there has been a lot of talk about the dangers of drain cleaners. Not only harmful to humans, these tough cleaning products can seriously harm the natural environment. One way to eliminate harmful cleaners from the home is to buy natural drain cleaners. These products don’t always have the same cleaning power as the toxic cleaners, but some would say it is worth the health of mother nature. This entry was posted in Green Developments, Independence Station, LEED and tagged green building, green drain, sustainable construction, water conservation, worlds greenest building on July 7, 2009 by Carol Morgan. Independence Station has launched a Facebook group titled Fans of the World’s Greenest Building. Facebook is one of the most popular social networking sites on the Internet and The World’s Greenest Building’s Facebook group will be a great tool for future residents to connect with the builders and developers, as well as other potential homeowners, in an innovative and unique way. This entry was posted in Independence Station, LEED and tagged Facebook group, green data storage, Independence Station, LEED rating, smart grid technologies, solar energy, vegetable oil, worlds greenest building on May 22, 2009 by Carol Morgan.